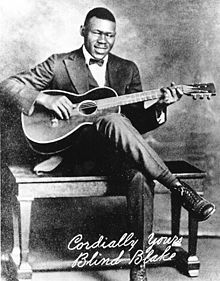 “Blind” Blake (born Arthur Blake; 1896, Newport News, Virginia – December 1, 1934, Milwaukee, Wisconsin) was an American blues and ragtime singer and guitarist. Blind Blake recorded about 80 tracks for Paramount Records from 1926 to 1932. He was one of the most accomplished guitarists of his genre with a surprisingly diverse range of material. He is best known for his distinct guitar sound that was comparable in sound and style to a ragtime piano. Jackson: What is your right name? Blake: My right name is Arthur Blake! There is only one surviving photograph of him in existence. His first recordings were made in 1926 and his records sold very well. His first solo record was “Early Morning Blues” with “West Coast Blues” on the B-side. Both are considered excellent examples of his ragtime-based guitar style and are prototypes for the burgeoning Piedmont blues. Blake made his last recordings in 1932, the end of his career aided by Paramount’s bankruptcy. Stefan Grossman and Gayle Dean Wardlow think its possible that only one side of Blake’s last record is actually by him. “Champagne Charlie Is My Name” does not actually sound like Blake’s playing or singing. Allegedly, Blind Blake was drinking heavily in his final years. It is likely that this led to his early death at only 38 years old. The exact circumstances of his death are not known; Reverend Gary Davis said in an interview that he had heard Blake was killed by a streetcar. A death certificate for “Arthur Blake” is listed by the Milwaukee County Courthouse (John La Fave, Register of Deeds, 901 N. 9th Street, Milwaukee, Wisconsin). It indicated the cause of death as pulmonary tuberculosis. Arthur Blake’s grave is in Glendale, Wisconsin, listed as Evergreen Cemetery (now Glen Oaks Cemetery) in a single grave #72, Range #115. It is unmarked as yet (no headstone). His complex and intricate finger picking has inspired Reverend Gary Davis, Jorma Kaukonen, Ry Cooder, John Fahey, Ralph McTell,Leon Redbone and many others. French singer-songwriter Francis Cabrel refers to Blind Blake in the song “Cent Ans de Plus” on the 1999 album Hors-Saison. On a few records where white jazz guitarist Eddie Lang sat in with African American groups, the record companies listed Lang as “Blind Blake”. 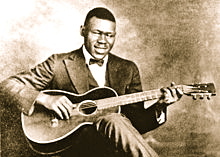 Most of those recordings, principally with Lonnie Johnson, gave Lang the name “Blind Willy Dunn”. There is also a different artist who recorded multiple LPs under the name “Blind Blake”. Alphonso “Blind Blake” Higgs was one of the most popular singers in The Bahamas in the 1950s, leading the house band at the Royal Victoria Hotel. His records were spread all over the U.S. by tourist fans, and several of his songs became folk standards.